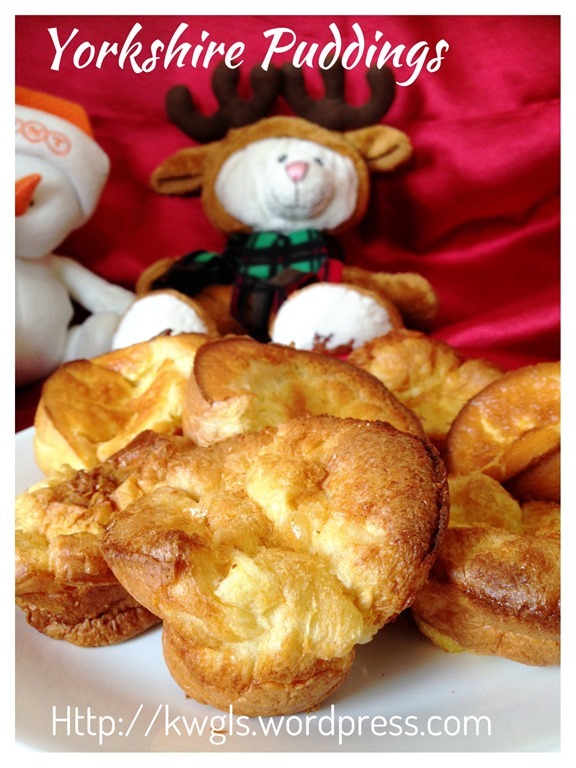 I know it is still early but keep this post and you will be able to prepare Yorkshire puddings for your Christmas feasts. However, it can also be served as as dessert to go with ice cream. 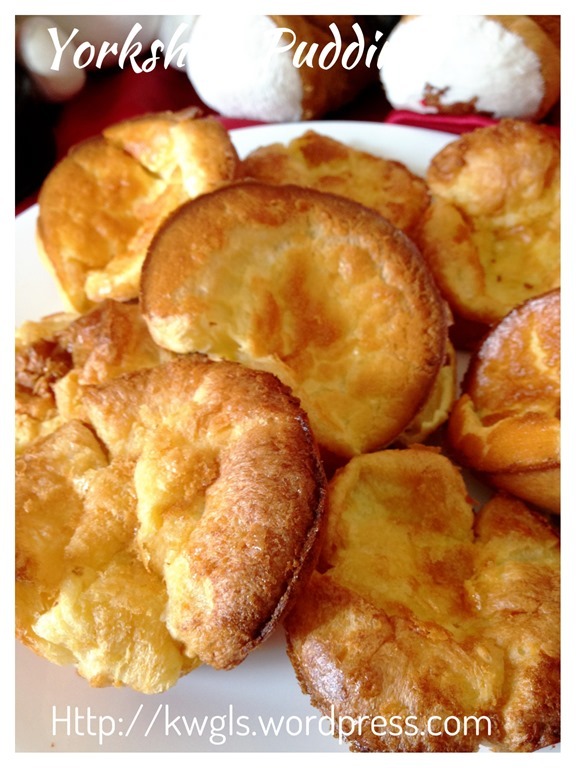 A good Yorkshire pudding should be rather light and thin, slightly chewy an a good absorbent of meat or sweet sauces.. 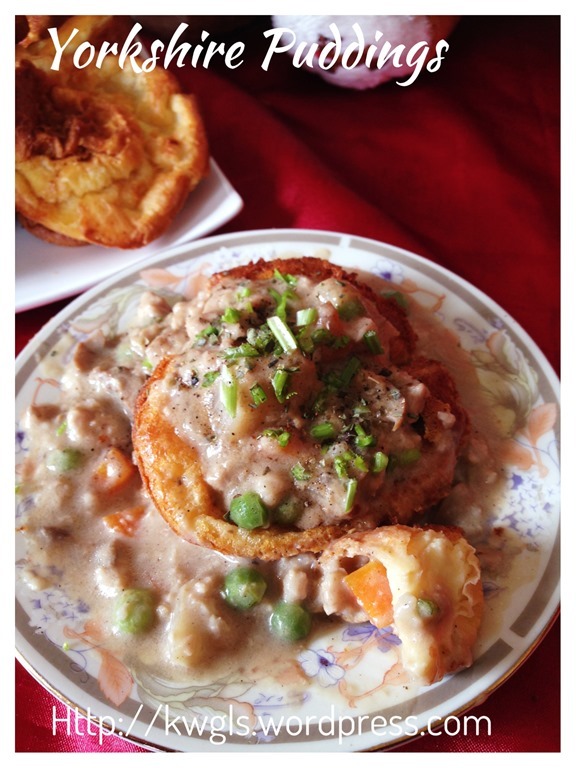 This recipe was prepared based on the definition of Wikipedia above. 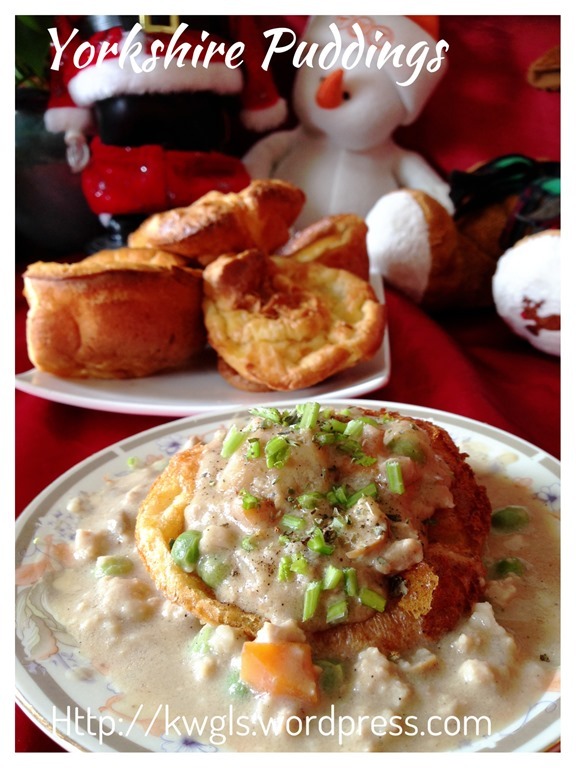 As Christmas dinner is yet to come, I have decided to prepare some mushroom soup for the kids to go with Yorkshire pudding as lunch… They love it.. and I do love it as well.. 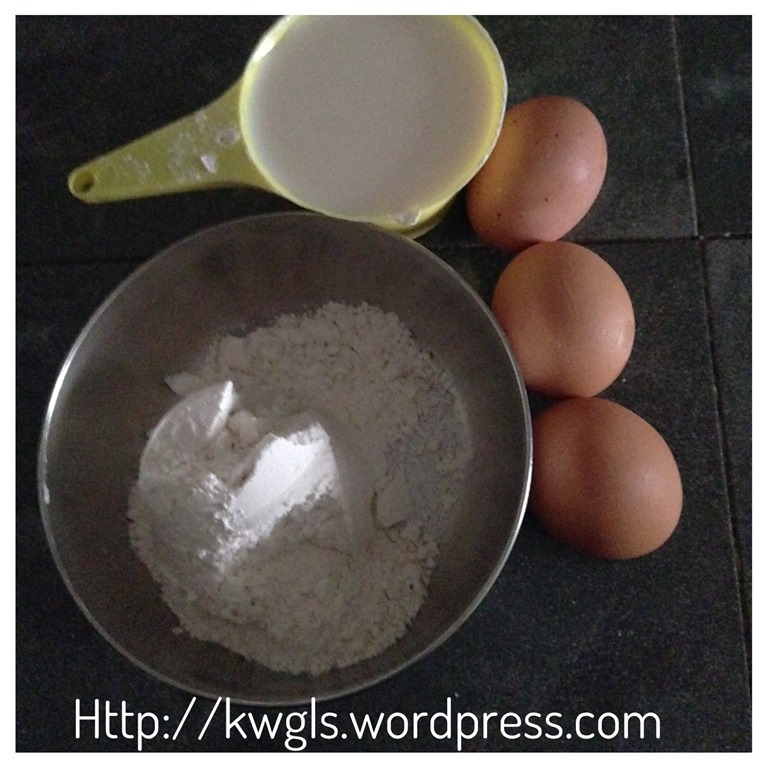 In a whisking bowl of standing mixer, add eggs, flour, milk . Mix until well combined with no lumps noted. Chill the batter in the refrigerator until the oven is ready. 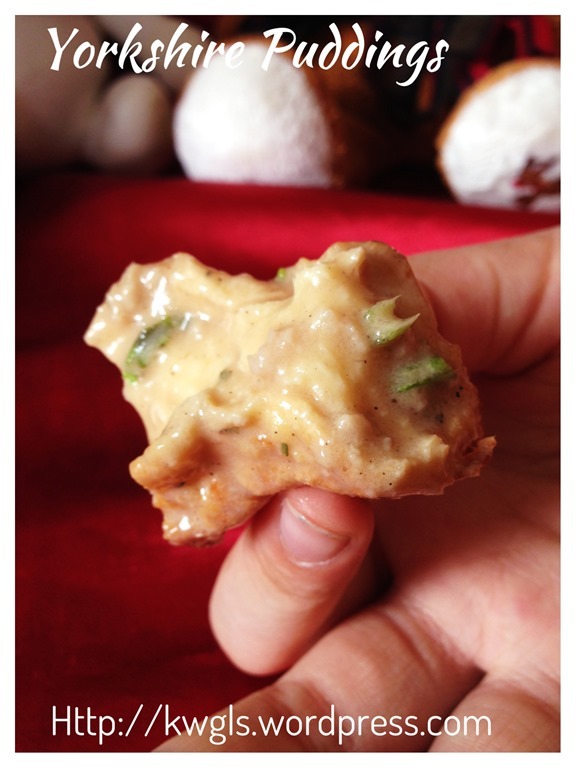 Grease a muffin tray adequately with cooking oil . 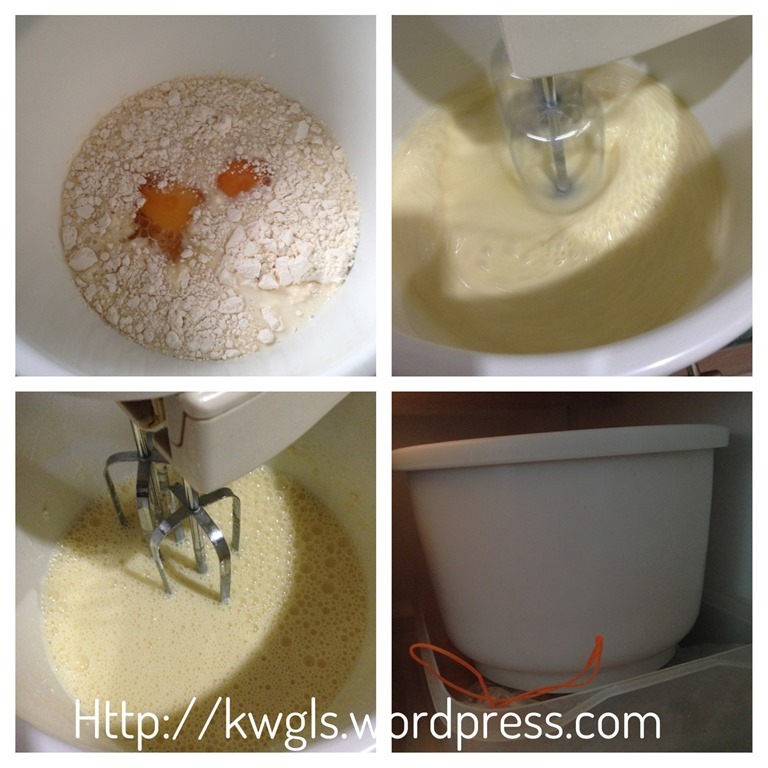 Grease the connecting part as well Put one tablespoon of oil in each muffin cup. Pre-heat the oven to 220 degree Celsius together with the greased muffin tray. Once the muffin tray is ready (most likely you will see some smoke from the hot oil), take out the batter, use the mixer to beat again for 1 minutes. 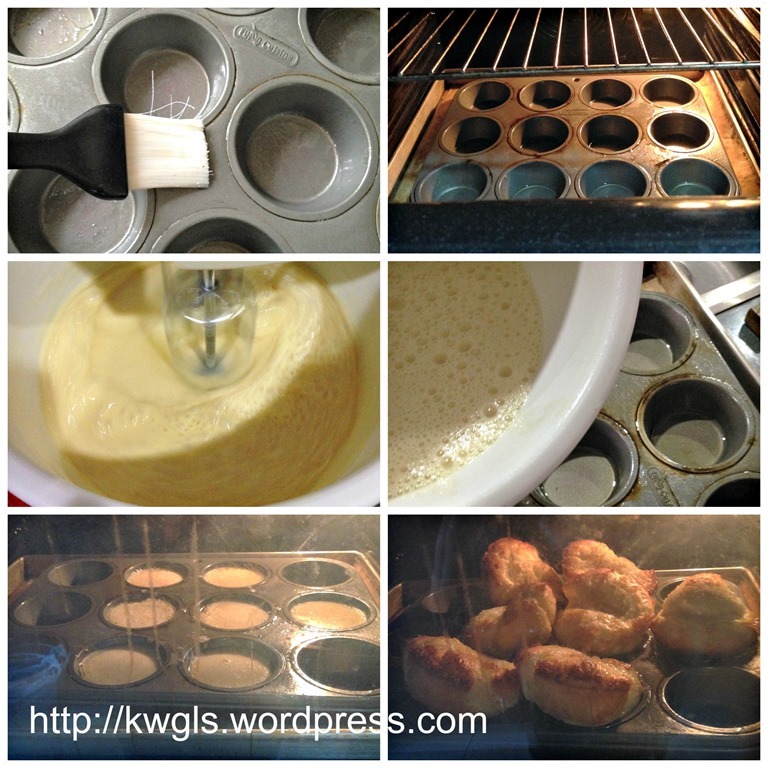 Take out the muffin tray and pour the batter on the hot muffin cups as full as possible. Transfer carefully to the oven, close the door and reduce the temperature to 200 degree Celsius. Bake for about 15 minutes and reduce the temperature to 180 degree Celsius. 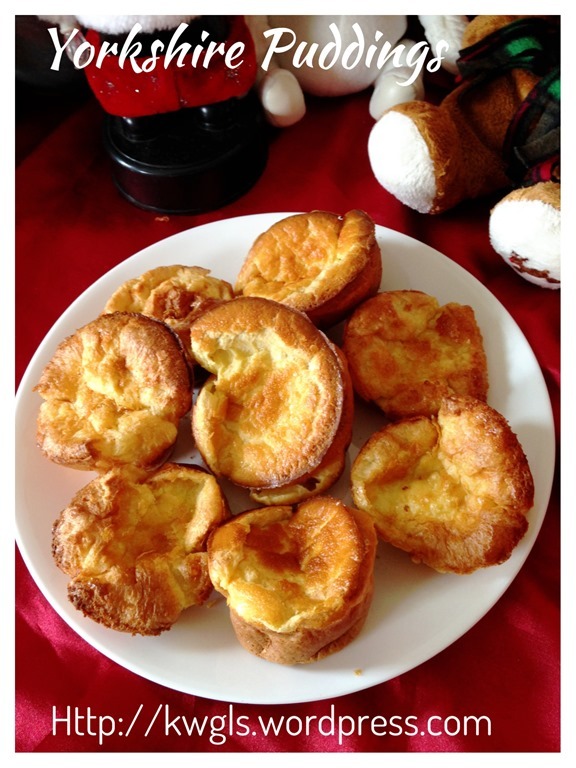 Continue baking for about 10 minutes or until the pudding puff up and turn golden brown. Off the heat, keep the oven door ajar by placing a chopstick in between the oven door and the oven. 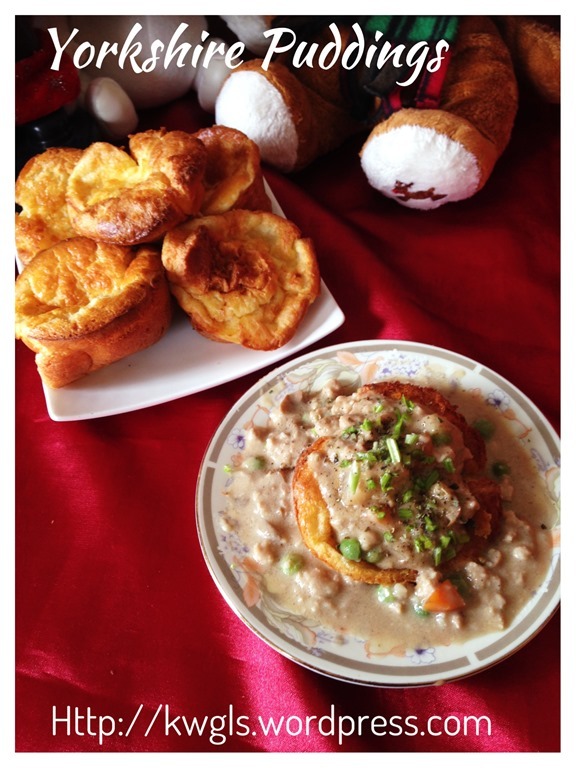 Leave it as such until the Yorkshire Pudding is cooled. 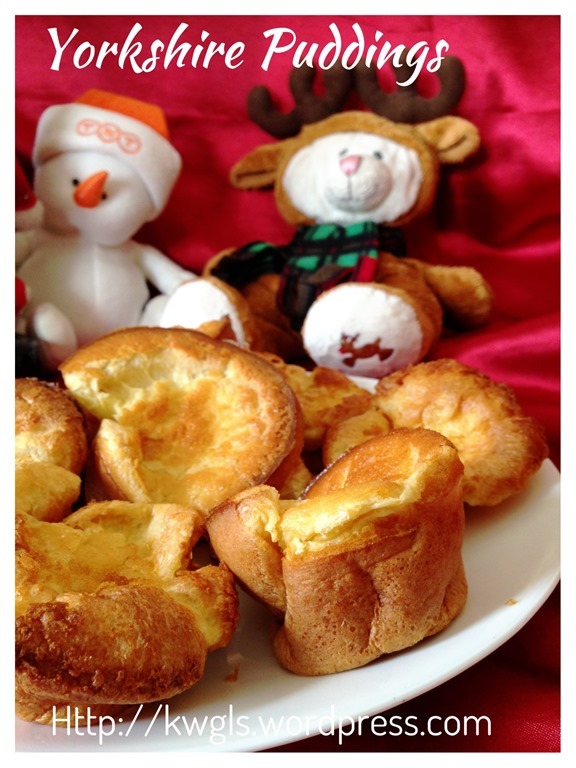 The main purpose of the step is to prevent a certain drop in temperature that causes the Yorkshire pudding to deflate. 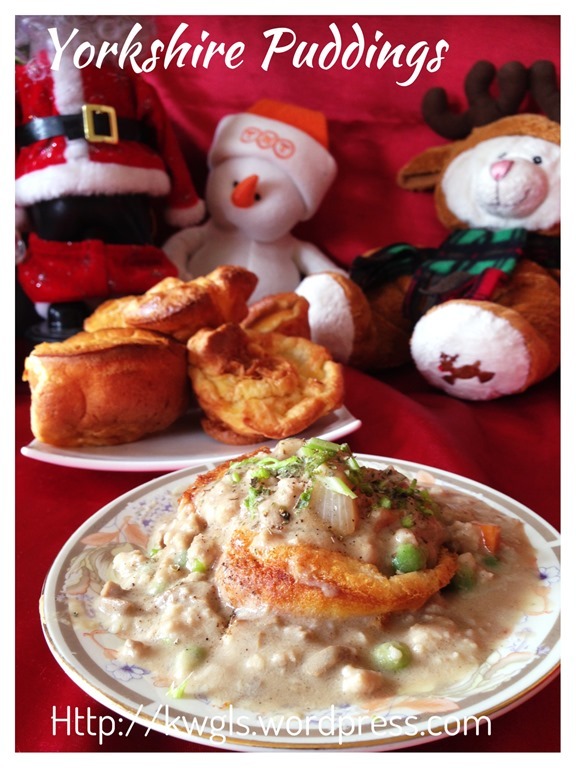 Best serve warm as a side item with meat dishes. This is a nice pancake to go with meat juices. One thing that I can think off is to eat with curry chicken.. It sure is a delicious treat. 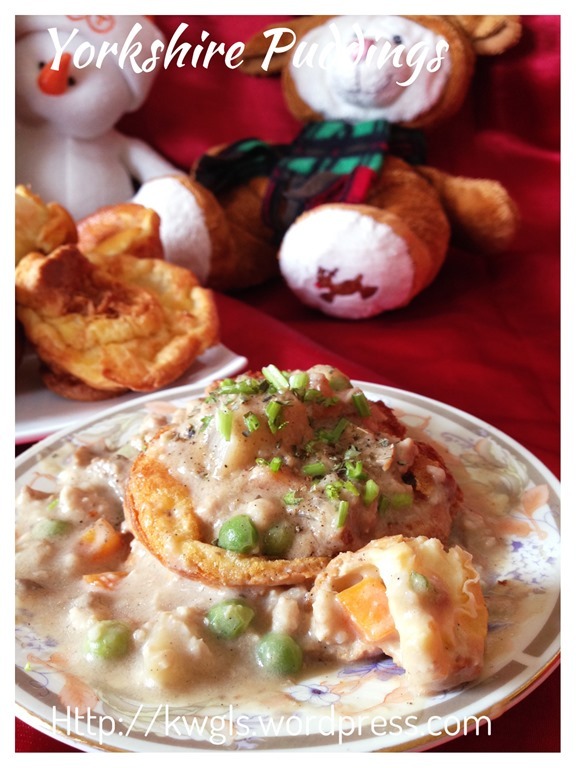 Hope this post will benefit those readers who are looking for this recipe. Remember that It can be eaten with ice cream as well.. 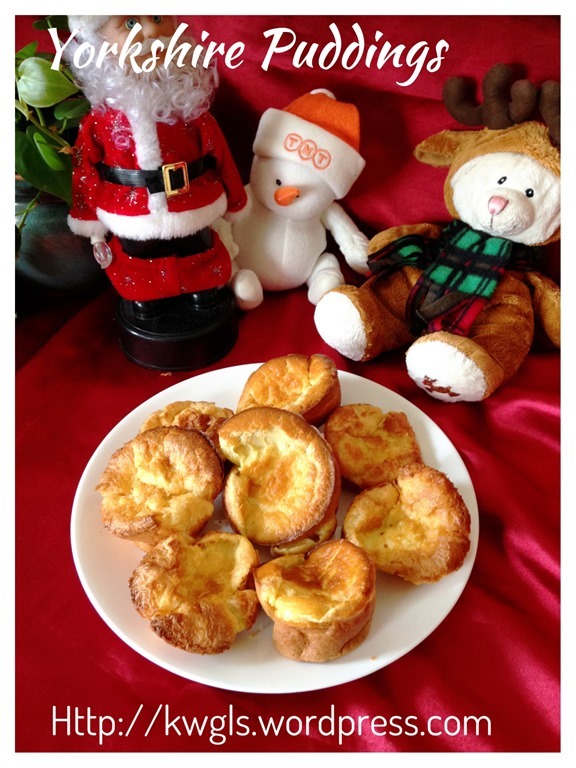 This entry was posted in Cakes and cookies, Christmas, Christmas 2013, Food Preparation Series, Party snacks or finger foods and tagged 8, Christmas 2014, 约克郡布丁, GUAI SHU SHU, Guaishushu, kenneth goh, postaday, Yorkshire Pudding. Bookmark the permalink.